Scientists working with the Curiosity rover used a piece of its navigation equipment—an accelerometer like the one in your mobile phone—in order to make an important measurement about Mars’ mysterious geology. Curiosity is currently roving around Mount Sharp, a 5-kilometre-high (3-mile) mountain in the centre of Gale crater. But it’s unclear whether the mountain is the result of the crater once being filled in and losing matter to erosion, or whether the mountain is more like a large dune of deposited material. Curiosity doesn’t possess a scientific instrument to determine the nature of the mountain—but it does have force-measuring navigation equipment. So the scientists got creative. “I realised you can download an app on your phone and, not with much precision, but you can measure [the force of Earth’s gravity] because your phone has accelerometers,” the study’s lead author Kevin Lewis, assistant professor at Johns Hopkins University, told Gizmodo. He figured he could do the same thing with Curiosity’s accelerometers, and perform some interesting science. Gravimetry, or precisely measuring changes in the local gravitational field, is a useful way to understand the rocks beneath the surface, since an object’s force of gravity increases with its mass. Apollo 17 had a gravimetry experiment to study the Moon, for example—but Curiosity does not have a gravimeter. It does have a navigational system, however, which includes gyroscopes and an accelerometer for measuring changes in velocity, acceleration, and orientation. The navigational system isn’t quite as sensitive as a gravimeter would be, but the scientists made do. They acquired the data on the accelerations experienced by the rover, then adjusted it to account for things like Curiosity’s location on Mars as well as potential effects of temperature and elevation on the equipment. 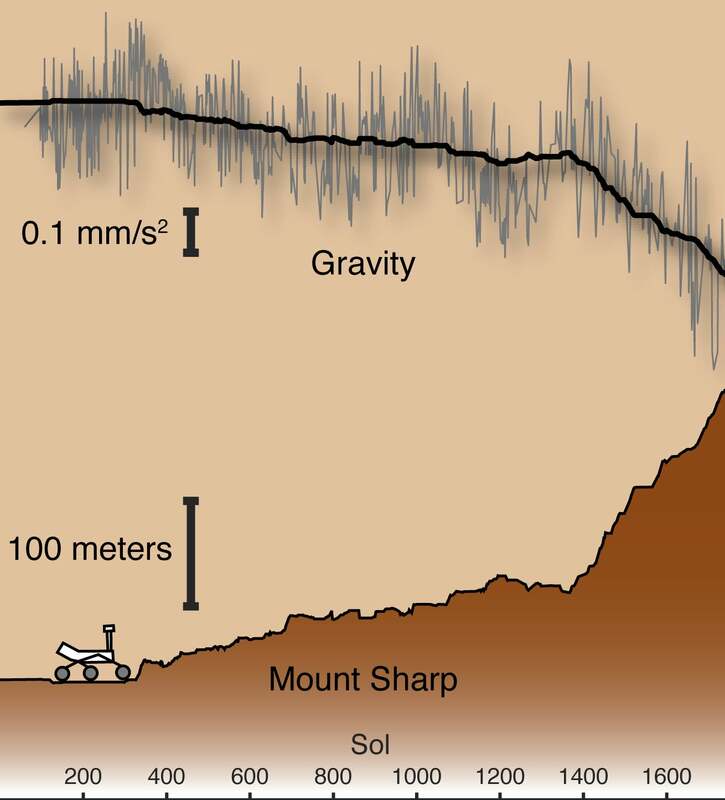 Their analysis revealed a surprise—the average density of the rocks beneath Curiosity was lower than expected. This implied that the dirt was much more porous, meaning it had more holes, than the scientists expected. They were further able to infer that the sediment wouldn’t be very deep, since otherwise it would be more compacted or filled-in. All of these points together seem to imply that Mount Sharp wasn’t the result of erosion creating a tall peak, but instead it formed through sediment blowing into the already-formed crater resulting in the enormous deposit, according to the paper published today in Science. “My first impression was that it’s a clever engineering trick to use instruments onboard the rover that weren’t designed as science instruments to actually do science,” Kirsten Siebach, Martian geologist and assistant professor at Rice University, told Gizmodo. She noted that the porosity value of the rocks was surprisingly high. She said the work seemed to confirm some previous observations of Gale crater but contradict others. “This pushes us to get a better understanding of what low-porosity rocks might behave like on Mars,” she said. Measurements like these come with inherent limitations, such as the introduction of potential biases when trying to pick out which data to use and uncertainties from using an instrument for a task it wasn’t designed for. But this is science, and the paper reveals new information that gets us closer to knowing what really might be going on inside the crater, and should be considered alongside other experiments, simulations, and data. And there are more experiments coming up to build the body of evidence: Mars InSight will be able to tell scientists about the planet’s geology more generally based on how heat flows through the planet, while Mars 2020 will have ground-penetrating radar to collect subsurface information on its landing location, Jezero crater.